No vacation is complete without some scrumptious dining! If you’re in California exploring the magnificent Yosemite National Park, you’ll soon discover there are many other things to do in its surrounding areas. While you’re enjoying these numerous local attractions, you’re sure to work up an appetite, so be sure to dine in some of the best Tuolumne restaurants while you’re here! No matter what you’re craving, you’re bound to find the perfect meal just for you. Browse this list of some of the best Tuolumne restaurants and start planning your foodie getaway today! Planning a vacation is no easy task! Download our free Vacation Guide to help you through this process; it contains all the best area attractions, activities, restaurants, and so much more. Treat yourself to an unforgettable night out by visiting the Black Oak Casino and Resort! Not only can you enjoy all the games and activities offered by the casino, but you also have several different dining options. The Seven Sisters Restaurant in Tuolumne, CA, is an excellent choice; they provide outstanding, high-quality dining in an upscale and elegant environment. If you’re looking for a more laidback atmosphere, then the Mill Sports Bar and Grill or the Turnback Creek Bistro are both good options. Also located in Tuolumne County is the city of Sonora. There are many restaurants in Sonora, CA, that are definitely worth a visit, such as The Peppery. This comfortable restaurant offers delicious, mouthwatering meals made from the freshest ingredients possible. They have tasty salads, burgers, sandwiches, soups, and so much more. There’s truly something for everyone at The Peppery in Sonora, CA! You’ll feel right at home the second you step into Talulah’s Restaurant in Sonora, CA! This cozy, family-style restaurant has so much to offer, so be sure to come hungry. They make all kinds of creative dishes as well as a wide selection of your favorite comfort foods. Visit their Facebook page to see what they have on the menu this week, then plan your visit! 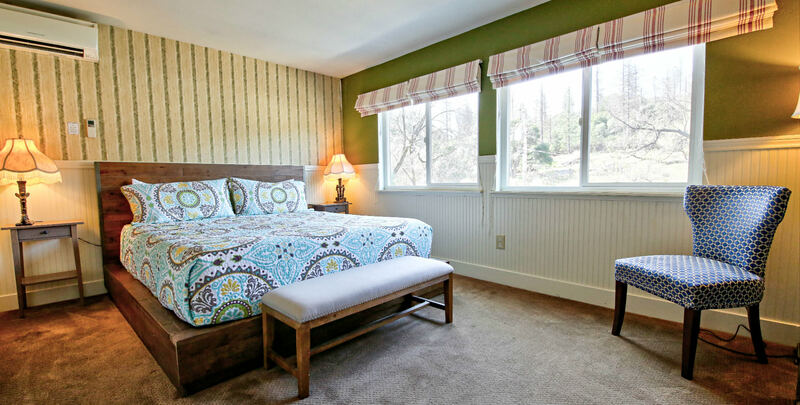 Stay in the best accommodations in Tuolumne County to complete your getaway to California! You’ll find even more amazing food prepared right here in the Hotel Charlotte! Our Fork and Love Restaurant within our bed and breakfast is a spot you can’t miss while you’re here. We’re located in Groveland, CA, at the gateway of Yosemite, and serve some of the finest foods prepared with delicious local ingredients. Our talented kitchen staff creates a wide array of delectable dishes that are bound to satisfy any appetite! After your filling meal, you can relax on our property. Stay in one of our many rooms or vacation rentals; we have everything you need for a comfortable and peaceful getaway. You won’t want to miss our delightful breakfast in the morning, either! Don’t wait another minute to start planning a trip to Yosemite. Check our availability and book the trip of a lifetime today!